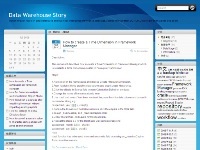 Details: The mydwbi blog aims at data warehousing and business intelligence technical aspects. We would particularly like to point out a very interesting IBM Cognos 8 Framework Manager technical tutorial and blog. Among other useful tips, it shows how to create a Time Dimension in Framework Manager, how to publish a package after modifying a model without impacting existing reports or switch to a SunOne Directory Server. Although the site is partially in Chinese, there is an English version of the most interesting articles. The blog covers such technologies as Cognos, Infromatica, Datastage, MicroStrategy, BO, NCR, Oracle, MS SQL Server and Sybase.